An engagement ring is an extraordinary thing. Not only in what it represents, but also in how it looks. 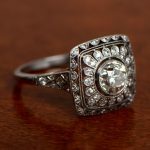 No other ring quite matches the splendor or appeal, and this is especially true when talking about vintage and antique engagement rings. 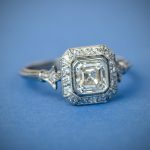 We now often see celebrities showing off rings costing hundreds of thousands of dollars, but a stunning ring needn’t cost quite so much. A stunning, incredibly lively 1.10ct old European cut diamond, this ring is adorable. With all the symmetry of Art Deco, but none of the aggression, the timeless elegance is unmistakable. To complement the H color VS2 center diamond, a pavé of old mine cut diamonds create the perfect halo. The handcrafted platinum setting completes the beautiful ring which is effortless in its beauty. To view this ring, click here. 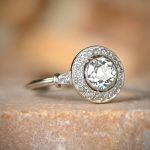 We get so used to seeing round cut diamonds, whether antique or modern, that it’s easy to forget there are other cuts out there. One which deserves more exposure is the Asscher cut. Here, the 1.01ct diamond is bezel set amongst 18 smaller stones. 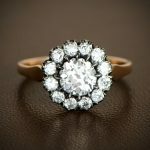 Along with the bold design and quality craftsmanship that has gone into every part of the ring, the overall effect is a little different and very beautiful. The price is just under $10,000, at $9,800. Click here to shop for this ring. Named after the English city, this Art Nouveau/Art Deco combination contains gorgeous symmetrical floral patterns which make it very unusual. The old European cut diamond at its center is 1.05ct and dates from c.1930. The overall look is entirely different from most engagement rings, and yet looks just spectacular when worn. This ring is a masterpiece and costs $8,400. To learn more about this ring, click here. 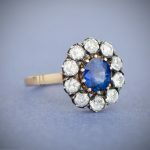 With a 1.45ct sapphire and dating back to the 19th century, it’s reasonable to assume nothing else is needed. However, while that may be the case, the Victorians liked to show off when it came to jewelry. Add a further ten old-mine cut diamonds totaling 1.90ct, and a yellow gold band and the end product is just superb. As beautiful as it is rare, this ring is a real wonder. The price of this ring is $7,800. To learn more about this sapphire ring, click here. 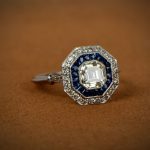 Dating back to 1920, this estate ring has an almost solitaire appearance. Ultra-fine milgrain and small diamonds run along the shank, with some incredibly detailed etching weaving in and out. The diamond itself is 1.20ct, and the delicacy of the whole package is wonderfully feminine and understated. This stunning ring cost only $9,800. View more about the ring by clicking this link. This is indeed a one-of-a-kind engagement ring. A handmade platinum setting acts as the presentation podium for a lovely 0.80ct diamond. The dome is completed with pavé set old mine cut diamonds and milgrain. 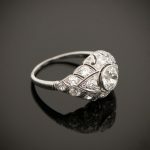 Although heading into the era of Art Deco, the ring is wonderfully Art Nouveau. With its slightly curving lines and full figured design, we end up with a truly unique design. The price of this stunning antique ring is $9,800. Victorian loved a cluster rings and, as a result, the designers of the time made sure not to disappoint. The 0.98ct diamond was cut in around 1900, towards the end of the era. Furthermore, the mounting is a combination of silver and gold. This works perfectly with the halo of old mine cut diamonds that surround the center stone. The price is $9,00 and the ring can be viewed over here. Who says engagement rings are all about the diamond? 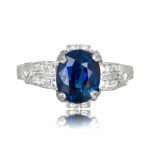 This lovely oval sapphire engagement ring has a 2.95ct sapphire at its heart, with diamonds contributing to an exceptional piece. The shank and gallery have a combination of exquisite milgrain and engravings which add tons of detail. The overall effect is incredible, with all the elements coming together to create a fantastic engagement ring. This ring has been sold, but it was originally under $10,000. If you would like to commission Estate Diamond Jewelry to handcraft a similar ring, please feel free to contact us. We’ve already said that the Asscher cut and sapphires can both work wonderfully in an engagement ring. Put them together, though, and the result is just outstanding. The stunning 1.09ct Asscher cut diamond would be enough on its own in any ring. Add in a bezel of French cut Ceylon sapphires and a pavé which brings the diamond weight to 1.45ct, and you have something special. This ring costs $9,800 as well. You can view this ring by click this link. Most engagement rings sold in America are under $10,000. The average salary in the USA is $56,000 and usually the common adage of two month’s salary, the average budget will be $9,333. We personally prefer not to use this method when establishing a budget. In fact, we invented an engagement ring budget calculator that is designed to generate an appropriate budget. The calculator factors in salary, social standing, spending attitudes, vacationing practices, and even current debt. We strongly advocate deciding upon a budget before shopping for an engagement ring. 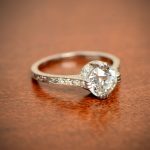 The engagement ring is a very important decision, but it is not enough of a reason to go into debt.